Leccy Tech Car giant Ford has released technical details about its Focus-based leccy car – the Focus Battery Electric Vehicle (BEV). 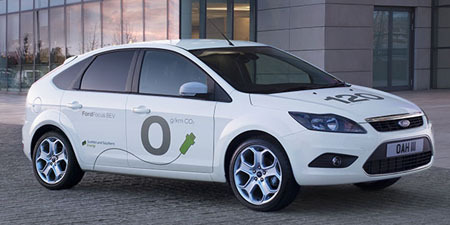 To create the Focus BEV, Ford essentially took a regular Focus and replaced its engine, gearbox and fuel tank with a 23kWh lithium-ion battery pack and 100kW/320Nm (134bhp/236lb-ft) electric motor. By combining the two, the Focus BEV can achieve a top speed of 85mph and cruising range of roughly 75 miles – Ford stated. Charge time from a domestic 240v supply will be between six and eight hours, Ford added. Those figures won’t make e-car enthusiasts stand-up and cheer, but then the Focus BEV isn’t actually a production model. 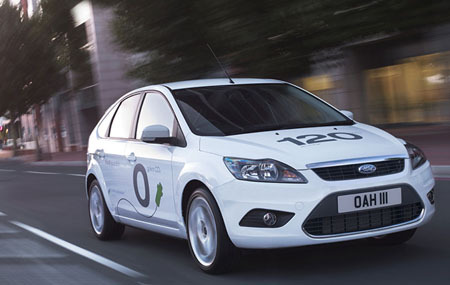 The car is designed for use in UK government's “Ultra-Low Carbon Vehicles” leccy car field trials, Ford stated. As part of the trials, a fleet of 15 Focus BEVs will be operated by Ford - in partnership with Scottish and Southern Energy and Strathclyde University - around the London Borough of Hillingdon from early 2010.